Example of the coral imagery analyzed by the ECOGIG team at Penn State to document coral impact and recovery after the DWH oil spill. Photo courtesy of Fanny Girard, Pennsylvania State University. ECOGIG researchers Fanny Girard and Chuck Fisher of Penn State University recently published a paper in the journal Biological Conservation entitled Long-term impact of the Deepwater Horizon oil spill on deep-sea corals detected after seven years of monitoring. The paper is a culmination of seven years of research since the DWH spill to characterize the impact of oil and chemical dispersants on deep-sea coral communities in the Gulf of Mexico. Deep-sea corals play an important role in the deep ocean by providing habitat, a refuge from predators, feeding grounds, and nurseries for mobile populations of fish and other animals. There are over 258 species of deep-sea corals in the Gulf. Deep-sea corals are generally long-lived and slow-growing, which makes them particularly susceptible to the negative effects of human activities, such as fishing (particularly bottom-trawling), oil and gas extraction, deep-sea mining and possibly the sediment plumes caused by these activities. The ECOGIG team visited over three hundred coral (Paramuricea species) colonies at three impacted coral sites and two reference sites each year since the 2010 accident and documented the coral’s condition using high-resolution cameras mounted on submersibles. The researchers developed a novel methodology for analyzing impact and recovery by digitizing the images in Inkscape to quantify the coral’s health and track recovery patterns. Each branch of coral was coded based on four categories: healthy, unhealthy (covered in floc, excess mucous, or exposed skeleton), colonized by hydroids, and unclassified. Although the median level of impact decreased after 2011 at all impacted sites, the impact level has been stable since 2011 and remains higher than at reference sites. The coral’s recovery depended on how much initial impact it suffered, and this was still visible seven years after the spill, indicating a long-term impact on the colonies. Increased branch loss from one year to the next was still observed between 2016 and 2017, indicating an ongoing effect of the spill. These results indicate that it will take many more years for impacted corals to recover and that some corals will likely never recover. 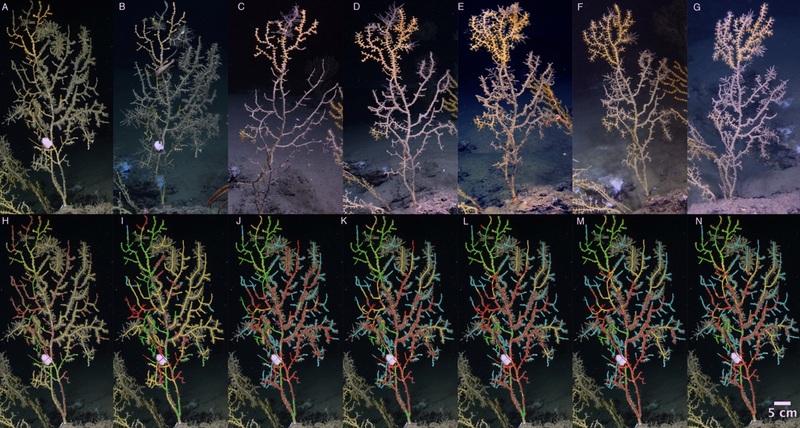 Analysis of high-definition images collected since the DWH event allowed the research team to detect relatively small, but important, changes in the health of deep-sea coral. This study (and previous studies by the team) demonstrates the effectiveness of this novel methodology and highlights the importance of long-term monitoring after a disturbance in order to fully document effects that may not be obvious until years later. The work also underscores the necessity of using a precautionary approach for the conservation of long-lived organisms. Based on this work, the researchers advocate for better long-term monitoring of deep-sea biological communities to support informed conservation decisions, such as the designation of Marine Protected Areas. Learn more about the work ECOGIG is doing to understand the impacts of the DWH spill on corals here.